Chalfont St Giles is a village within the Chiltern district in southeast Buckinghamshire, on the border of the beautiful Chilterns, approximately 25 miles from London. Chalfont means chalk spring, which refers to the water carrying abilities of the local land. 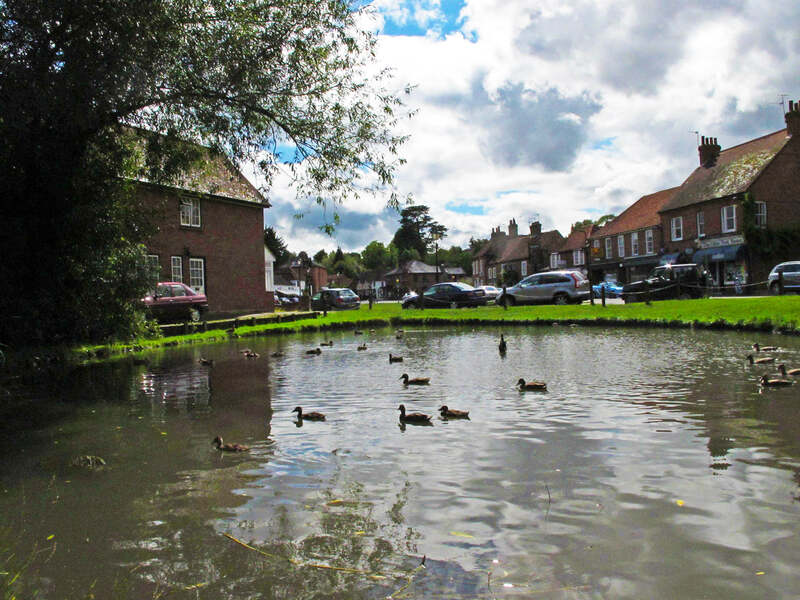 A famous feature of the village is the River Misbourne fed duck pond. During the Great Plague of London John Milton moved to Chalfont St Giles, where he wrote the poem, Paradise Lost. His cottage still stands, and is open to the public. More recent notable residents of Chalfont St Giles include Ozzy Osbourne, Brian Connolly, Noel Gallagher and Nick Clegg. It is little wonder people are drawn to live in this scenic village, as the central village green with the pond, half-timbered housing and the ancient village pump help to create the timeless British Village atmosphere. In 2009, the village received the European Diploma of the Council of Europe award for its efforts to improve European unity. Chalfont St Giles was declared the “Best Village in Britain” by a Channel 5 property TV series due to the location, excellent schools, and beautiful scenery. Just 25 miles from London, the village has excellent rail and road transport links, with frequent mainline and underground services. The M40 and M25 are also easily accessed. The Chalfonts is the perfect place for those looking to buy a detached family home. However, property prices are not cheap, and you are unlikely to find anything at all under £500,000. Many such houses in the village will have a value of £3 to 5 million. Most of the village housing stock was built after 1920, and there are a number of fine period cottages and houses in the Chalfont St Giles. Most buyers in the village are families moving out of London for the fabulous schools and lifestyle, or those trading up to larger houses. Moving in the Chalfonts can be hideously expensive, so adding to your current home is the most straightforward solution if you need more living space. Why Choose Touchstone To Convert Your Chalfont St Giles Loft? Touchstone is a leading company in the loft conversion sector. We offer an initial advice and feasibility survey plus quote free of charge. Our rates are very competitive, and if needed, we will take care of any permits on your behalf. Because we are a loft conversion company and not general builders, every part of your conversion is done in-house, by us. As no work is ever outsourced, we guarantee all the work is completed to a consistently high standard. We have converted many lofts of all types and sizes in Chalfont St Giles during the last three decades for property owners who need more space or who want an extension to add significant value of their home. Many of our Chalfont St Giles clients were direct referrals. So join our happy Chalfont clients, and get in touch with us by calling 0800 881 8194 or fill out our contact form. We will call to arrange the best time to survey your loft. Once we learn what you want from a conversion, we provide a free no obligation quote.